The world-famous Royal Hospital Chelsea is set to benefit from the sale of this attractive Sweet Pea called Scarlet Tunic. 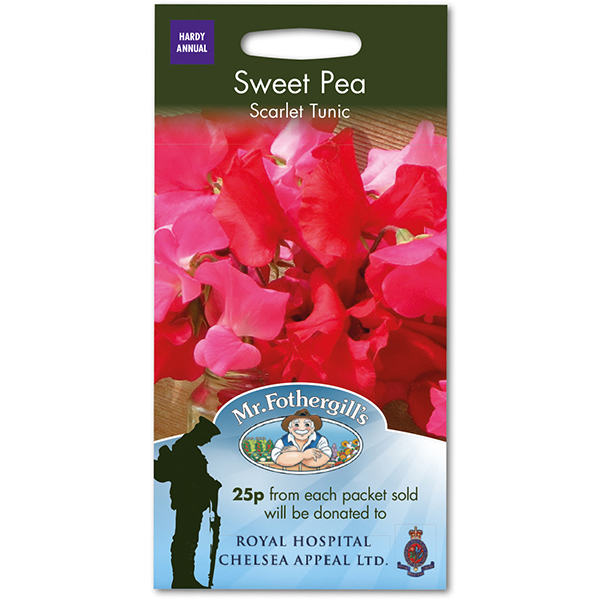 Mr Fothergill's has pledged 25p to the Royal Hospital's charity from every packet sold. 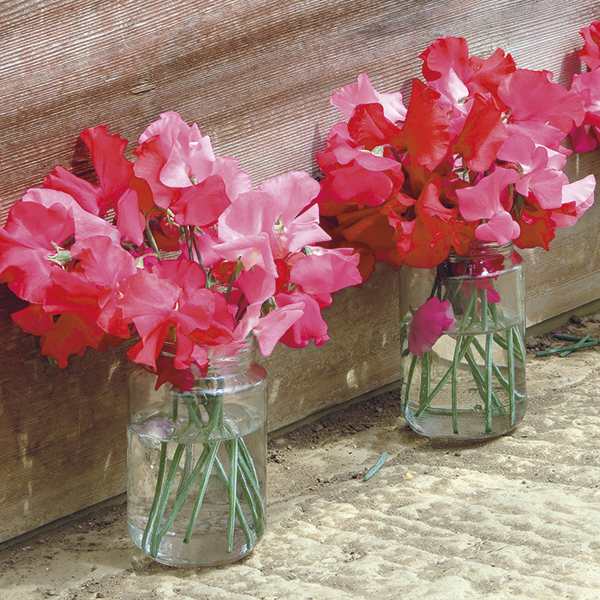 Sweet Pea Scarlet Tunic can be sown where it is to flower, it's an outstanding mix of large flowers. Ideal for garden displays and as a cut flower. Established in 1682 by Charles II to provide a safe home for military veterans 'broken by age or war', the Christopher Wren-designed Royal Hospital admitted its first pensioners in 1692. The scarlet tunics and black tricornes of its residents and the Royal Horticultural Society's Flower Show held in the Royal Hospital grounds every May are equally well known and respected around the world. Sow indoors for surest results, January-March or September-October, 1.5cm (½in) deep, 5 seeds per 12cm (5in) pot of compost. Water well and place in a cold frame, greenhouse or cool windowsill. A temperature of 15°C (60°F) is ideal. Keep moist. Seedlings usually appear in 12-21 days. Pinch out the growing tip, when two pairs of leaves have formed, to encourage bushy growth. Gradually accustom young plants to outside conditions (avoid frosts), before planting out into well-drained soil, March-May, 30cm (12in) apart. Or, sow outdoors for ease, April-May, where they are to flower, 1.5cm (½in) deep, directly into finely-prepared, well-drained soil, which has already been watered. Sow 2 seeds together, every 30cm (12in). Remove weaker seedling, which can then be transplanted. Seeds sown in autumn generally flower earlier the following year. Flowers: May to October. Pick blooms regularly to prolong the flowering season.